Today, as the complex interaction in space is caused by the development of Information and Communication Technology (ICT) and intelligent built environment the interaction method between each component in space has become more important. The design of space has been shifted to the paradigm exploring the relationship between the components in the built environment based on various data. This study is aimed to define and propose the new intelligent interface and system which is able to provide user-oriented experience based on the interaction physical and virtual through the paradigm shift in space. To do this, with the exploring theoretical consideration and related research for the potential of data application and technical evolution, the individualize, flexibility, efficiency, expandability, controllability, heterogeneous, interactivity, and symbolization for the new interface are driven. This dissertation draw out the parameter and designed conceptual model for the relationship in each step by sorting the adaptable architectural system in built environment and type of interactions. 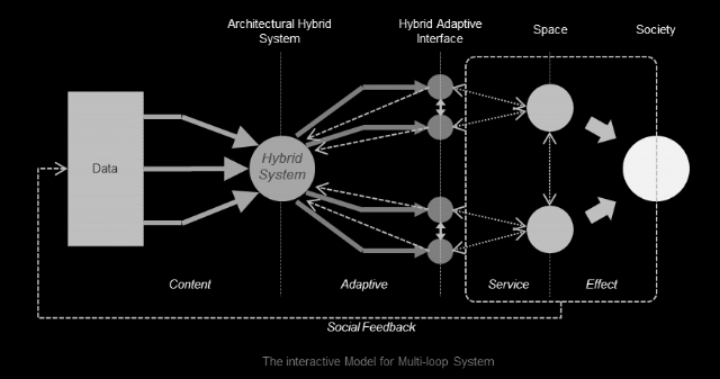 The architectural hybrid system and hybrid adaptive interface in this study realise the ideal service which provides user-oriented experience. This obtains the sustainability as an extended social value through the social interaction with a network in a certain society. This approach is expected to be used as a framework presenting a methodology for the research development and application in the study of built environment based on the interaction. With the advance of ICT and supply of mobile device, spatial-context data which contains the information of space contextual information is required these days. Through the IoT and M2M, it has enabled to evolve into new service. Intelligent media platform which provides customised data by recognising the user's location, and to discern the situation of users based on it. This research provides the development direction of an interactive intelligent interface. In addition, it is expected to be the framework of advanced service content and creation of idea which support user behaviour by having regard to user’s requirement and space contextual information.